In the wide and wonderful world of Fringe, we all know there are hits and misses. 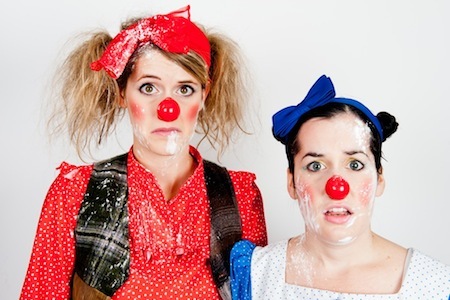 I was keen to start myself off with a hit – to set the tone, so to speak – and picked Morro & Jasp: Go Bake Yourself as my first Fringe show. As ever, these Fringe-favorite clowns are delightful as they scrap and scheme. Morro, the mischievous younger sister, and Jasp the older and-also-wiser-just-ask-her, have cooking show aspirations but vastly different visions of how this cooking show will manifest. Morro imagines a Kitchen Stadium, BBQ Battle, Who Cooked It Better type of situation, and gears up accordingly in her kitchen armour for the fight. Jasp, a more mature young lady, sees a refined, classy cookery programme as befits her grand (self-)image. Hijinks, as you can doubtless imagine, ensue. The best thing about a Morro and Jasp show, consistently, is how well they keep the exact right amount of tension between the whimsical, devil-may-care Morro and the more socially aware, bossier Jasp. Like the skin of a soap bubble, that comic tension is the loveliest and also most fragile part of the entire enterprise. They stretch it, relax it, and then stretch it again so skillfully that it doesn’t matter at all which of many possibilities is tonight’s particular disagreement. Byron Laviolette, of the steady hand and unbearably romantic name, keeps this mess and mayhem – his seventh pairing with the clown duo – on track, so they don’t veer too far into the silly or serious. Heather Annis and Amy Lee, as Morro and Jasp, are obviously, demonstrably, talented women. Their shenanigans make you laugh and sigh and shake your head and feel glad an old-fashioned, inherently comedic word like “shenanigans” exists to describe them. I won’t do a play-by-play of the show itself, so you can enjoy some surprises on your own. All I’ll say is this: the flat seating and the same-level stage is only fair in terms of a view so choose a down-front seat or an aisle for better sight-lines. And also that vegetarians – especially vegetarian men – may want to avoid the front row. Individual Fringe tickets are available at the door for $10 ($5 for FringeKids), cash only. Latecomers will not be permitted.